The Edwardsville Glen Carbon Community Pool at SIUE’s Cougar Lake has opened after a month of piping issues delayed the pool’s season. The pool was scheduled to open Memorial Day, but a leak developed in the water filtration system. The City of Edwardsville repaired the system and the pool officially opened Monday, June 26. The pool will be open all Fourth of July weekend, including the holiday. 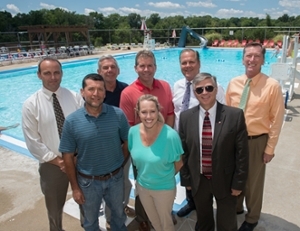 SIUE leased the pool to the City of Edwardsville, which has operated it as a municipal pool in cooperation with Glen Carbon since Spring 2016. The pool includes a slide and “splash pad” area for younger children. Family memberships (4 persons) start at $320, single memberships are $175, senior citizen memberships are $150 and daily passes are also available for $5 per day or $4 per day for seniors and children 4-15. Kids three-and-under swim free. Private rentals are also available for birthday parties, reunions and more. For more information on hours, memberships and party rentals contact the Edwardsville Parks Department at 692-7538 or visit cityofedwardsville.com. Photo (L-R): City of Edwardsville Director of Public Works Eric Williams, Streets Superintendent Matt Taul, Director of Parks and Recreation Bob Pfeiffer, Recreational Activities Supervisor Hayley Verheyen, Mayor Hal Patton, Glen Carbon Mayor Rob Jackstadt, SIUE Chancellor Randy Pembrook and SIUE Vice Chancellor for Administration Rich Walker.